Stir together cilantro, paprika, cumin, salt, turmeric, ginger and garlic. Rub mixture on all sides of chicken. Coat chicken with flour. Place chicken in ungreased rectangular baking dish, 13x9x2 inches. Stir together water, lemon juice and bouillon granules; pour over chicken. Add olives and lemon slices. Bake uncovered about 1 hour, spooning liquid over chicken occasionally, until juice of chicken is no longer pink when centers of thickest pieces are cut. Serve with couscous. Turmeric is an aromatic spice with a brilliant yellow color and a pungent, slightly bitter flavor. Often used in Indian and Caribbean cooking, turmeric is commonly added to poultry, rice, seafood and egg dishes. 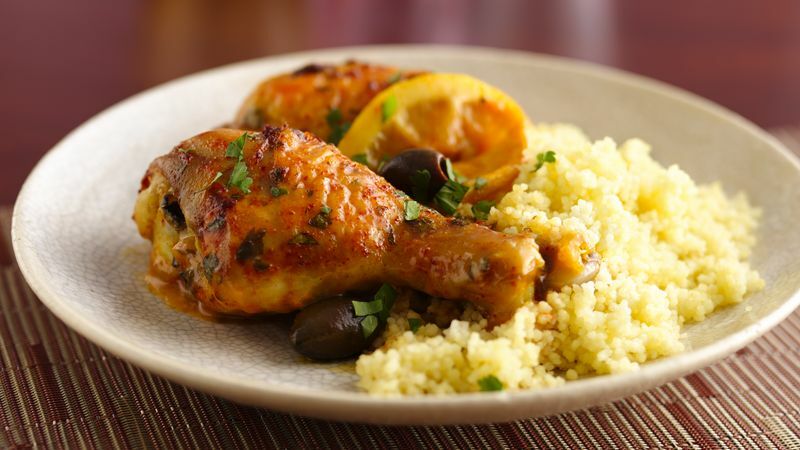 Kalamata olives garnish this Moroccon dish to add a slightly salty flavor. Greek or even ripe olives can be used if you can't get Kalamata olives. Dress up this dish for entertaining when you serve it beside couscous with raisins and Middle Eastern flatbread.